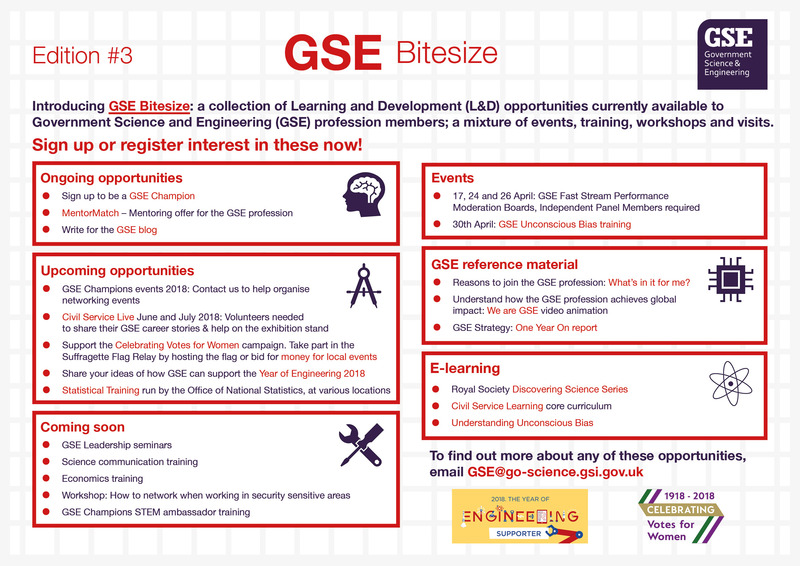 The third edition of GSE Bitesize: a collection of upcoming Learning & Development (L&D) and employment opportunities available to GSE members. This edition of GSE Bitesize is not one to miss. To attend and get involved in the events, sign up to be a GSE member now (it takes two minutes). It was British Science Week last week and the Big Bang Fair took place in Birmingham. There are lots of other regional Big Bang events happening up and down the country all year, too. If you would like to write an article for the GSE blog on an event you ran then please get in touch. 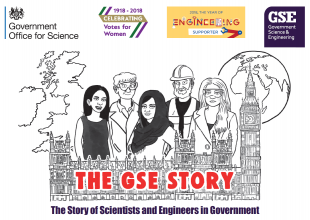 GSE are proud to support the celebration of the centenary of women's suffrage in the UK, as well as the government's official 2018 Year of Engineering. Learn more about your institution taking part in the Suffrage Flag Relay or share your ideas for how to support the YoE 2018 by getting in touch with us. 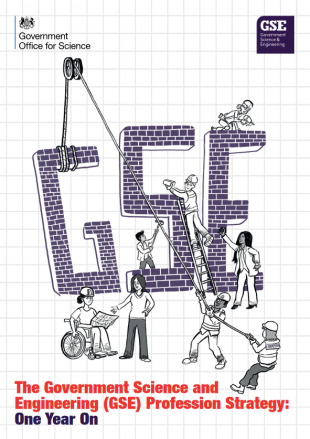 Coming up in the June and July, GSE will be hosting an exhibition at Civil Service Live, and we're looking for volunteers to help on the stand and share their GSE career stories. Following the success of last year's event at the Met Office, the GSE team will be running another networking event for GSE Champions in May 2018. 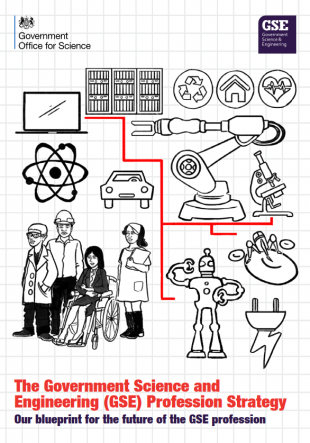 To find out more about becoming a Champion, and help to support and grow GSE in your department, have a read of the guidance and then drop an email to GSE@go-science.gsi.gov.uk. We have arranged training on Unconscious Bias for GSE members, which will introduce the techniques for challenging, preventing and removing issues of unconscious bias in the workplace. Take a look at our full list of opportunities below, and find links to further information and sign up on this PDF version. The Department for Health and Social Care are advertising for two HEO roles: Managing the UK Antimicrobial Resistance programme (a high priority for the Chief Medical Officer) and providing support to the team in parliamentary business; and providing policy and financial guidance for the Infected Blood scheme, which supports those infected with HIV and/or Hepatitis-C from NHS-supplied blood in the past. Two vacancies at SSO and HSO level are available at the Food Standards Agency: Joining the Chief Scientific Adviser's team and leading the devlopment of FSA's strategic science engagement; and protecting public health by carrying out out microbiological risk assessement in relation to the food chain. 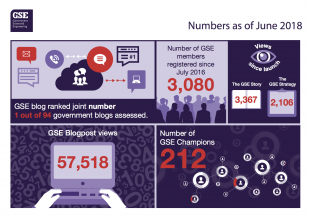 Sign up to the GSE blog to keep up to date with the work of the GSE profession.